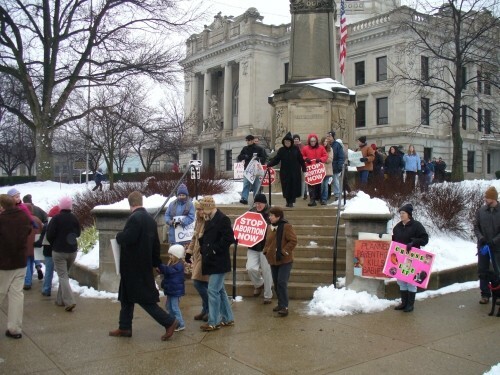 Local opponents of abortion gathered at the Monroe County Courthouse today for the 2007 Rally for Life. Every year, Monroe County Right to Life organizes the rally to sadly remember the 47 million babies that have been killed since the Supreme Court struck down state bans on the barbaric practice in 1973. This year, Church of the Good Shepherd's pro-life group played a critical role in organizing the annual Rally for Life. Tina Tuley-Lampke spoke about the Crisis Pregnancy Center and the work they are doing to help women avoid making the choice to abort and to help both mother and child after the baby is born. A representative from Silent No More then gave a heartbreaking story about her own abortion and how it has hurt her and her husband years after the fact. 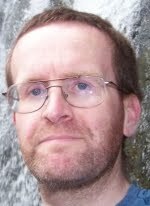 Brian Bailey gave the keynote address encouraging us to be pro-life in our own lives by providing food, shelter and clothing to the less fortunate. Bailey spoke from Matthew 25:31-46 and reminded us that as we do this for others, we do it for God. Do not the unborn count as the "least of these" that Jesus talked about? After the speeches, we walked around the courthouse square and many stayed and held signs on the corner. As is expected, some drivers passing by with a "thumbs up" or a honk of support while others screamed profanities at us. While in past years we had walked down Walnut Street to Second Street and back up College Avenue (a route chosen because it goes directly by Planned Parenthood) the weather presented safety concerns that prevented the longer march this year. About 130 people attended the 2007 Rally for Life. 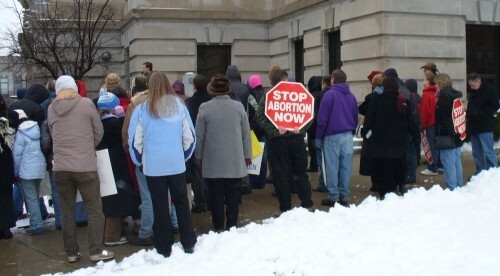 Local pro-life activists rally at the Monroe County Courthouse. 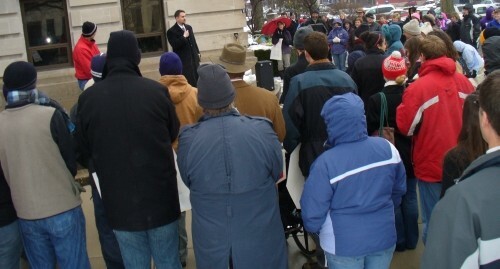 Pro-life attorney Brian Bailey delivers the keynote address. 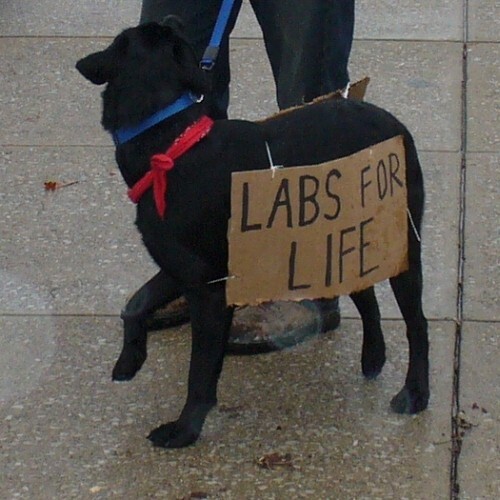 Humans are not the only ones who are pro-life. Pro-lifers begin the march around the courthouse square. See previous articles on the 2006 Rally for Life, 2005 Rally for Life and 2004 Rally for Life.